Cao Daism is a religion combining Christianity, Buddhism, Islam, Confucianism, Hinduism, Geniism, and Taoism. To put it in another way, Cao Daism is a perfect synthesis of the world’s most powerful religions. In the early 1920s, Cao Daism was established in southern Vietnam but it had not been officially codifieduntil 1926. 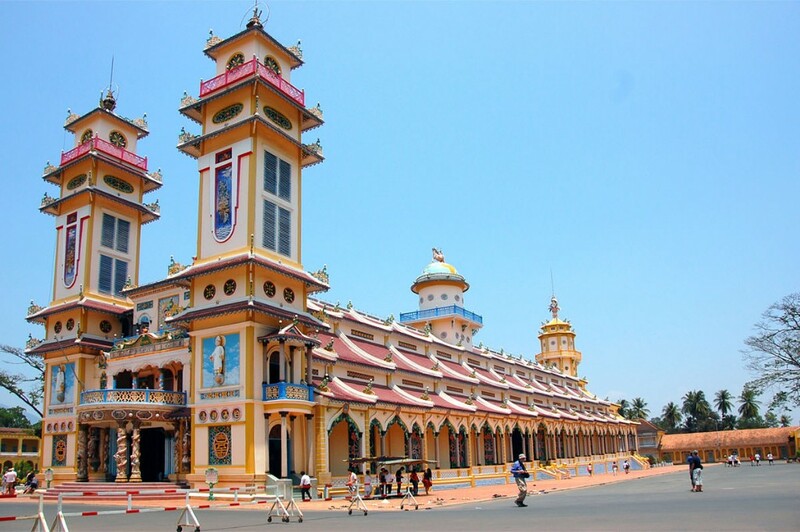 In Vietnamese language, Cao Dai means “the high tower”. The philosophy of a Cao Daism practitioner is to perform faithfully to his self, his family, society and the world at large. Nowadays, the headquarters of Cao Daism is located in the city of Tay Ninh, Vietnam. This is not only a holy temple but also a spectacular construction that attracts tourists from many places around the country and the world. As the main cathedral of the religion, the Cao Dai Great Temple stands vividly today in Hoa Thanh District, 5km southeast of Tay Ninh City. The construction of the temple started in 1933, but it was not completed until 1955. The temple spreads over an area of 5600 m2 with a length of 140m and a width of 40m. It consists of 4 towers which are named differently as Tam Dai, Hiep Thien Dai, Cuu Trung Dai and Bat Quai Dai. Even though both the interior and the exterior are decorated colorfully, a holy and sacred atmosphere still reigns all over the temple. Walking inside this great site, tourists can find a colonnaded hall and a huge sanctuary. 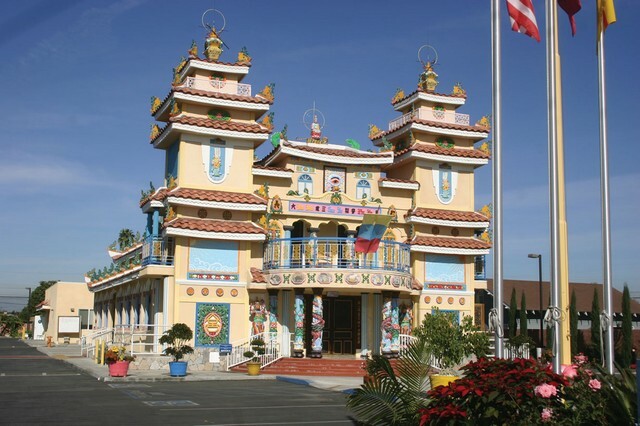 Everywhere, the columns are decorated with dragon symbols and painted in white, red, pink and blue paint. The dome in the main hall is divided into 9 parts which symbolize heaven. This is actually the painting of a starry night. The dome is located above a huge blue globe, on which the Divine Eye, the official symbol of Cao Daism, is painted.